Do you ever remember back when you were a kid? (I know, it’s hard for me too. That’s a lot of thinking…) But back when you started school and you had this great, totally rocking outfit for fall, but the only problem was it was still 1,000 degrees outside. So naturally math class was roughly 1,000,000 degrees. Ugh, the worst. 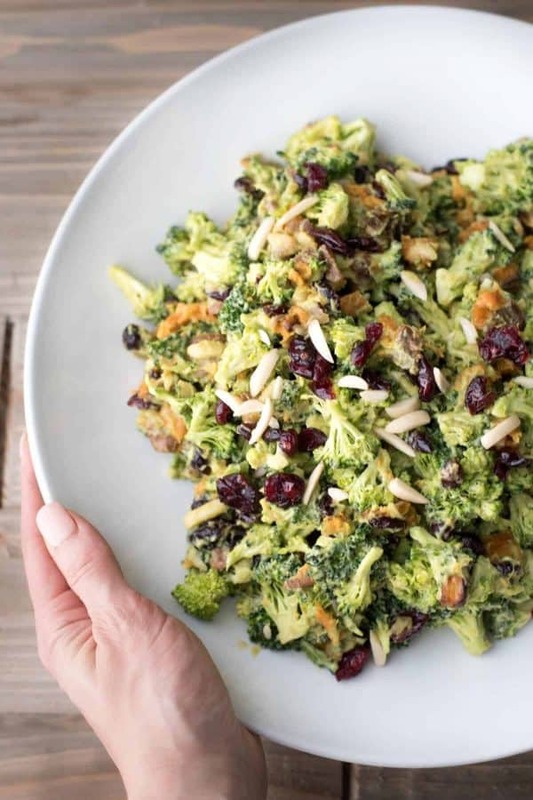 Fall fashion on hold, let’s stop to enjoy this Endless Summer Broccoli Salad. That situation described above? Totally true. Every year. Is air conditioning a thing now in schools? If it is, kids will never know the struggle. Like dial up internet. BUT….there’s always a silver lining. 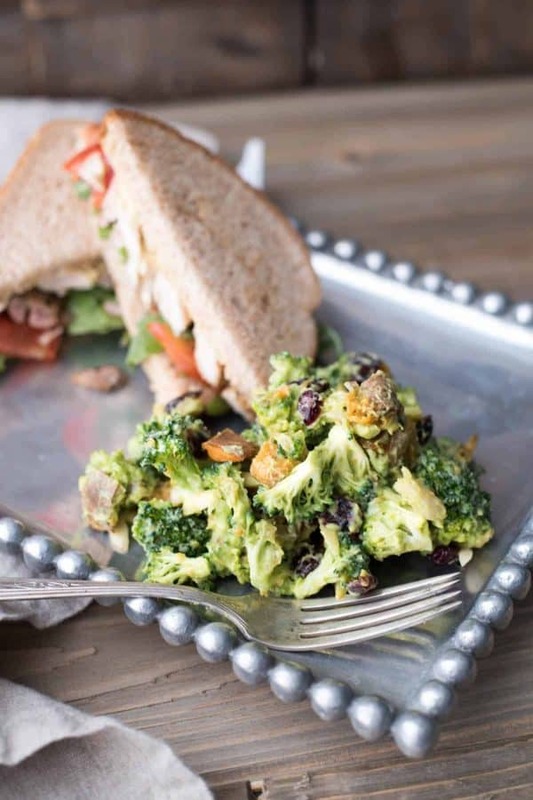 Endless Summer Broccoli Salad. The go to favorite of barbecues and summer get togethers in this house. Yep, you read that right. 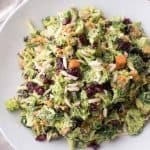 This broccoli crunch salad is an homage to my mother-in-law. Since the time we started uniting our families, “could you bring that broccoli salad you make?” would will always be my request of every get together. She and I, we’re like peas and carrots. We get hangry. We like to drink wine, we need to have a plan, and porch sitting is a favored activity. And she is so good to us with Shea and childcare coverage. So thank you universe for a great mother-in-law. And thank you Pat for the bones of what became this Endless Summer Broccoli Salad. The Best Part?!?! 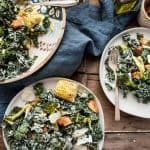 Is it the crunch of the broccoli? The sweet of the dried cranberries? The savory sweet potato and sautéed shallots? Don’t make me choose, they’re all good. For me, the best part is this creamy, best-served-chilled, summertime staple has ZERO mayo. Mic drop. While my relationship with mayonnaise has changed over the years (thank you Sriracha aioli), still can’t get into the mayo based salads. So when I first tried Pat’s broccoli salad with trepidation, I was pleasantly greeted with a sweet and tangy dressing. But still, I wanted out with the mayo and in with my favorite green friend. 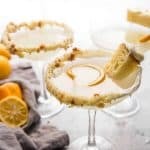 It’s creamy and dreamy, savory and sweet. 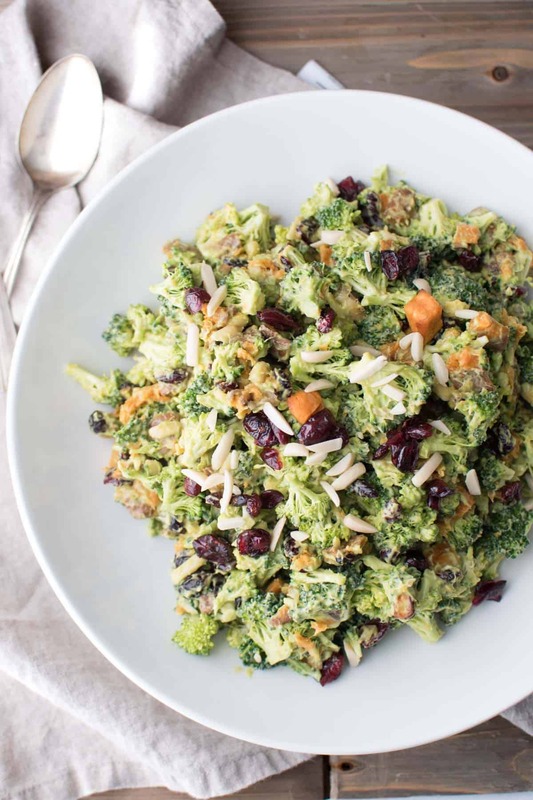 Endless Summer Broccoli Salad is the yin, Avocado Dressing is the yang. Cookout balance achieved. 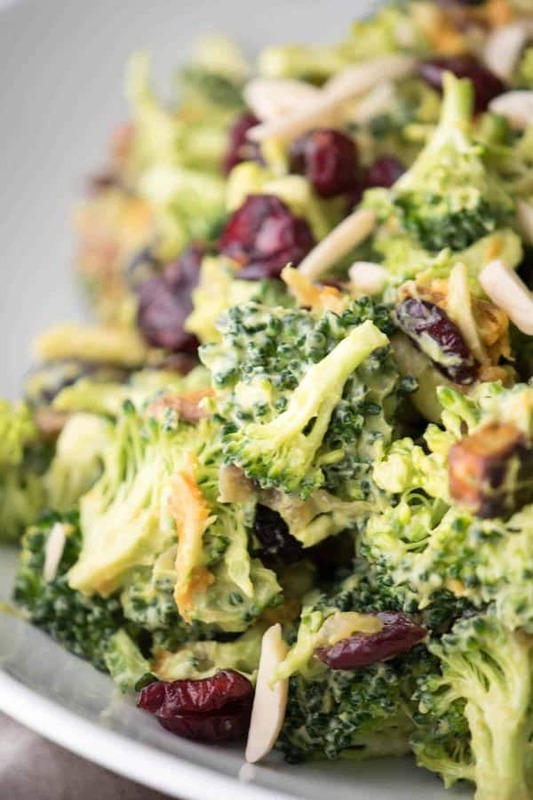 In each bite, a satisfying crunch from bite sized broccoli and slivers of almond. The sautéed shallots are the sneaky hero with that buttery, saltiness that really pops. 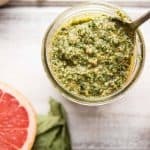 Creamy avocado dressing is just a touch sweet with the right balance of acidity from the vinegar to get all the ingredients jiving together. For a summertime tip, try roasting the sweet potato in the toaster oven – if you have one – to keep the kitchen nice and cool. And while this is the star side dish for summer, year round consumption is totally approved. When firing up the grill this weekend, give this BBQ Spice Rub a try. It’s perfect for all types of protein, but we specifically give it two thumbs up for ribs. Or for a fun twist on rosé, this Lavender Peach Rosé Slush recipe has been on repeat all summer. But if you’re in charge of the apps, try this Lobster Guacamole while all that fresh New England Lobster is still on sale! A last recommendation for your Labor Day menu – if something sweet is what you crave, these Mini Rum Plum Cherry Picnic Pies from Kristen over at Feast in Thyme are A. adorbs and B. totally divine and C. you don’t have to put down your drink while you eat them! 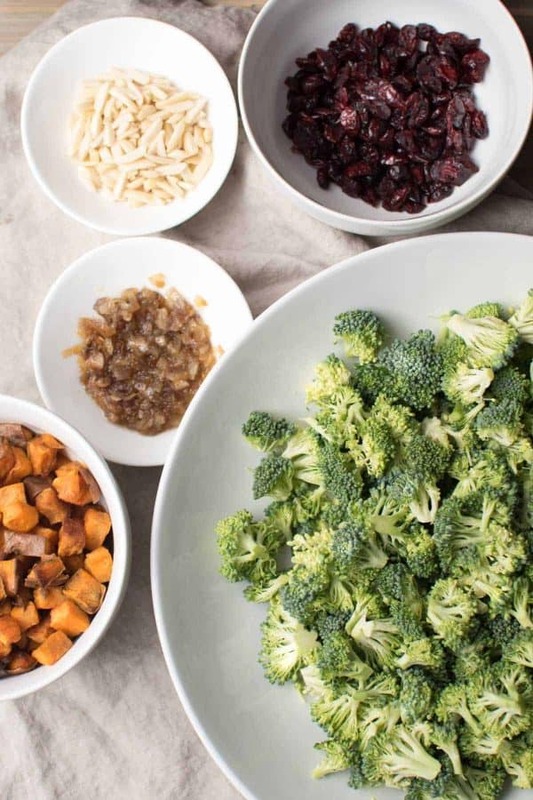 Crunchy broccoli florets, sweet cranberries, savory sautéed shallots and sweet potatoes cloaked in creamy avocado dressing make – perfect for summer pot lucks. Cut avocado in half the long way, remove seed. Scoop avocado into food processor. Add sugar, yogurt, and vinegar to the food processor. Blend until completely smooth. Add water and blend until incorporated. Refrigerate while preparing the salad ingredients. Preheat oven to 375F*. Thoroughly wash sweet potato. Cut into 1/2 inch cubes. Drizzle with 2 tablespoons of olive oil and sprinkle with salt. 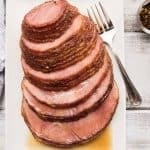 Roast for 30 to 40 minutes until cooked through and slightly crispy. Let cool slightly. In a sauté pan, melt butter and oil over medium heat. Add sliced shallots and sprinkle with a general amount of salt (about 1/2 teaspoon). Bring heat to high and cool for 2 minutes, sautéing occasionally. Reduce heat to low and simmer for 5 minutes until tender and a little crispy. Let cool slightly. 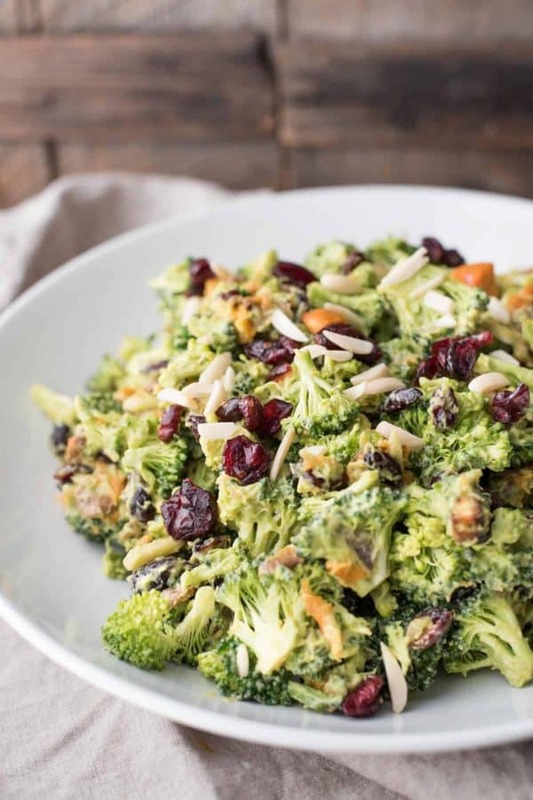 In a large bowl, combine broccoli, cranberries, almonds, and shallots. Cover with the creamy avocado dressing and stir well to evenly coat. Add sweet potato and mix to incorporate. Served chilled. Will keep up to 3 days if kept refrigerated in an air tight container. 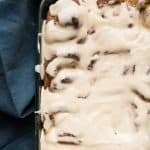 For a vegan version, substitute coconut yogurt and vegan butter. You can substitute all oil for vegan butter, but the final texture of the shallots will be more crispy and less caramelized. This is a summer salad. If you have a toaster oven, try roasted the sweet potato in the oven rather than using a big oven for one silly potato. You don’t have to add the sweet potato last, but it will keep it from squishing while stirring in the dressing.